This is a free report. Due to the steep decline in the Self-paced eLearning industry, Ambient Insight will no longer publish commercial syndicated reports on eLearning. 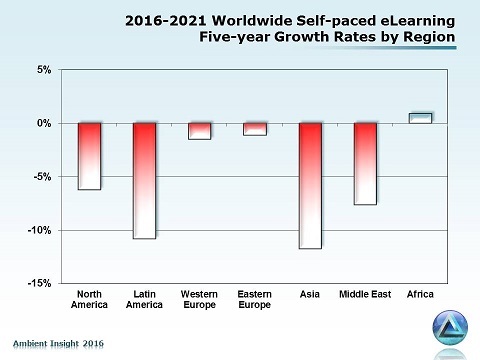 Ambient Insight will continue to track the industry and will publish free annual whitepapers on the global Self-paced eLearning market. 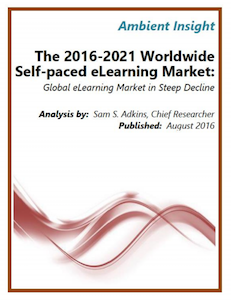 The global eLearning industry is now in the midst of a perfect storm of market conditions that are driving revenues down including weak demand for most self-paced products, commoditization, the late stage of eLearning’s product lifecycle, pronounced product substitution, and the so-called leapfrog effect with buyers in developing countries completely bypassing eLearning for newer products. What do you think? Harsh? Or Real? I don’t think this is the death knell of e-learning, but rather the end of the line for over-priced, ineffective content that has been sausage-machined into an e-learning format. It’s time to demand more of your learning technology. Use it to support vibrant pedagogy, not merely as a distribution mechanism. Handy guide to mobile learning BuzzWords. Make sure you to know enough to separate out the Buzzword Buffoons from the serious practitioners. Use our handy scoring guide to figure out who knows what they are talking about, and who’s drinking a little too much of their own KoolAid.